While it might not look like much, the goal is to make a three floor home. Developing prototype modular prefabricated straw bale walls & home as a proof of concept for the Denver/Mountain West market. A sustainable (strawbale) residential house that is very low-cost, rapidly constructed, modular and modern. To own my own straw bale house that is cheap and can be constructed on limited land. Use Scandinavian design inspiration with traditional construction form via Ancestral Puebloan’s Square Tower House, Mesa Verde. Sustainable construction materials, that are low cost. To support the development of sustainable construction and low energy and low carbon living. 4/11/19 Will be taking part in a in person 4-week-long class learning conventional construction techniques, usually for infrastructure construction projects… but will give me a good base on how not to build a straw bail house. 3/15/19 Basically need to skill up and learn from community building in UK. 2/17/19 Land hunting, determining budget and location… three hours away from Denver? 2/4/19 Colorado has so many pro-straw bale companies. Just need to finish business plan and reach out to them. 2/3/19 In order to get land, share business plan of sustainable housing, not as a development but to counter home scarcity. 1/22/19 Saw that a video of prefab wood walls can be made with high Rvalue. Nice European inspiration. 1/7/19 Finally finished books on straw bale houses and construction. Notes went into business plan and feel like I know what to do next. 1/6/19 This article gives a good blueprint on how to get funding. “What actions can policymakers take to avert the brewing national housing crisis? 12/25/18 Need to reply to one of my enquiry emails, but saw this video of prefab cabin in Norway. I really like the simplicity but also the larger house developed by the architect. Also, need to make a model of the dream house. 12/17/18 Sent out an inquiry email to prefab staw bale building company and sustainable construction company. Put together the crowdfunding page, try and request basic construction plans to use as a blueprint and as a fundraising tool. 11/23/18 Barn door with reclaimed wood, consider loft or deck. 11/11/18 The first draft of my pitch deck is live! Now working on the rest of the business plan, on the Opportunity, Execution, Company and Finical Plan. Will continue to focus on Nordic Sustainable Development as an overall theme in the business plan. 10/2/18 Re-rented two books on straw bales construction. Re-thought out goals of making sure land is found first, getting partners for labor, sourcing materials, and engagement with crowdfunding. 8/20/18 Thinking of the name for this new company, focusing on straw, the number three, and house or design in the TLD. Inspired by this company that focuses on Nordic Design. Finally, going to try and restart the business model canvas and create a website and document that I can start sending to individuals. 8/13/18 Learning about local groups like the Colorado straw bale organization, earth block construction companies, inspired by Tesla Tiny House. Finally, have enough information to put together a business plan for early investors and the above groups. Just need to start writing those emails and making the business plan in writing (and including the good points in this article. Also, inspired by this Instagram account. 7/12/18 Don’t like rowhouse but do like staircase along one side of building for two or three floors. 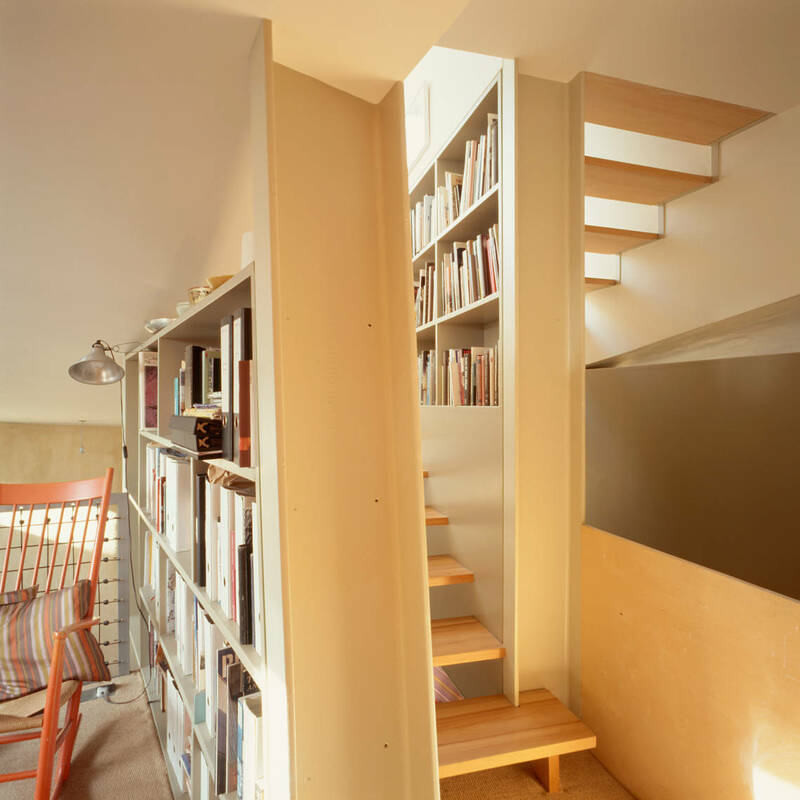 Also, narrow staircases allow for functional height but can save space. 6/24/18 Slight delay, but goal to find land that is three car spaces deep, two spaces wide. 6/6/18 Read Chris Magwood, Essential Prefab Straw Bale Construction: The Complete Step-by-Step Guide (Sustainable Building Essentials Series). Finally feel like I have a plan as I now understand the scope of the project, building materials and how to build the straw bale panels. Going to make google spreadsheet phases of construction. Looking now for partners. Also looking how to buy and build on a very small plot of land 2-3 parking spaces wide. 2/11/18 Took notes on the four books. Found good resources and connections of people doing workshops, straw bale magazines, and construction code for Colorado. Notes can be found here. 1/2/18 Rented four books on straw bale construction, reaching out to contacts for advice.